» Last night Fr Abbot was at our parish in Studley, Warks, to confer the sacrament of Confirmation on a number of young people. The visit allowed him to catch up with Fr Benedict, the parish priest. » Today our two gold cantors' copes were returned after restoration by our seamstress Sally Fish. 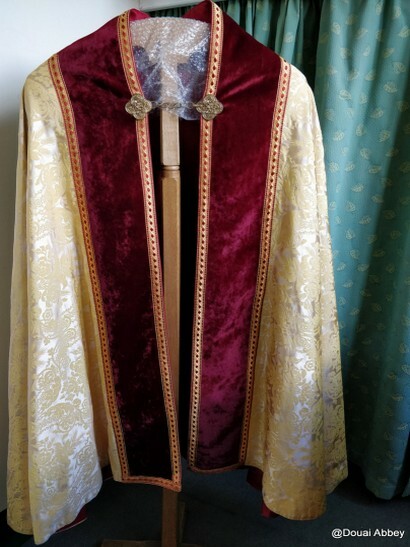 The damask fabric had been in excellent condition already; she replaced the reb velvet on the orphreys and hoods, and the braiding which surrounds the velvet, as well as cempletely relining both copes. 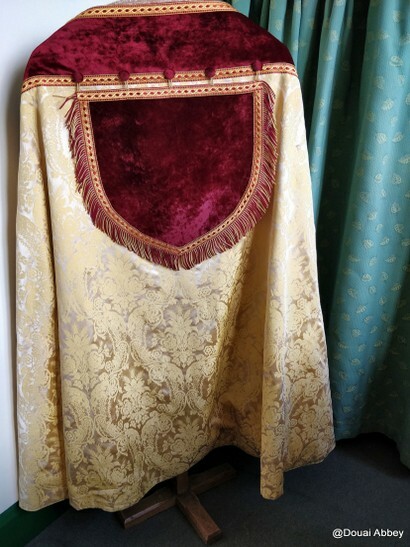 These beautiful copes are now as new and ready for the next solemnity.